From exquisitely wrapped antique beads and rare exotic woods to precious metals and cherished crucifixes, rare handmade rosaries make exquisite gifts for special occasions and are highly valued among collectors worldwide. In the Catholic faith, the rosary has great significance and special meaning. The Latin word for rose garden, a rosary is representative of the devotional prayers to the Virgin Mary. The prayers are said to honor Mary and the life she led. Praying the rosary is a time for reflection and remembrance of all the events in your life and the lives of mankind leading to salvation. It is a time to thank and praise God. The term rosary also stands for the actual prayer beads. There are many different styles of rosaries made from various combinations of metals, beads, or wood. Handmade rosaries are unique in that each one is a beautiful creation filled with religious tradition and symbolism. Many antique and vintage handmade rosaries are family heirlooms, crafted by a loved one for a special occasion such as a wedding, birth or confirmation. Others became gifts crafted to celebrate a special milestone for a beloved priest or to a deacon on their ordination. What Makes a Handmade Rosary Rare? Each handmade rosary is a labor of love and a work of art. However, each one is not considered rare. For a handmade rosary to be considered rare, one or more of the following criteria generally has to be met. The rosary has a provenance linking it to a religious leader, priest or other member of the Church. The rosary has a provenance linking it to someone that is well known. The materials used in the rosary are antique, one of a kind, or vintage. This includes ivory, sea coral and bone. The materials are precious or semi-precious gemstones, rare or lampwork beads or pearls. The materials are rare or exotic woods. The rosary is made of precious metal. The crucifix and center are highly detailed or sculpted. They may contain gemstones or crystals or have Calvary scenes with the Virgin Mary and John at the foot of the cross of Jesus. The rosary dates from the early 1960s or before. The designer or crafter of the rosary is well known. Truly spectacular handmade rosaries are offered from the Rosary Workshop. 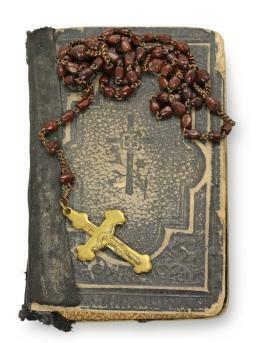 Made with antique or vintage materials, each rosary is a rare, unique and beautiful work of art. Even the centers and crucifixes are all hand cast in silver or bronze recovered from vintage and antique pieces. The Rosary Workshop offers more than 150 handcrafted rosaries including rosaries by American bead artists Grace Ma, Paula Radke. The following are examples of several of these exquisite handmade rosaries. Rare handmade rosaries make beautiful and memorable gifts for special religious occasions, anniversaries or birthdays.